A Complete Nutrition Formula with no artificial colors or flavors and no synthetic vitamins. 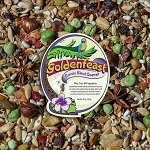 For all small to medium sized hookbills from Parrotlets to Amazons. More than 50 wholesome ingredients. 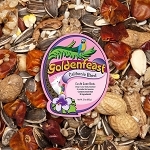 The in-shell Georgia Pecans add natural foraging fun to this highly nutritious blend. Fruits, vegetables and herbs are dehydrated unless otherwise stated. Beans are cooked and dehydrated for better nutritional absorption. 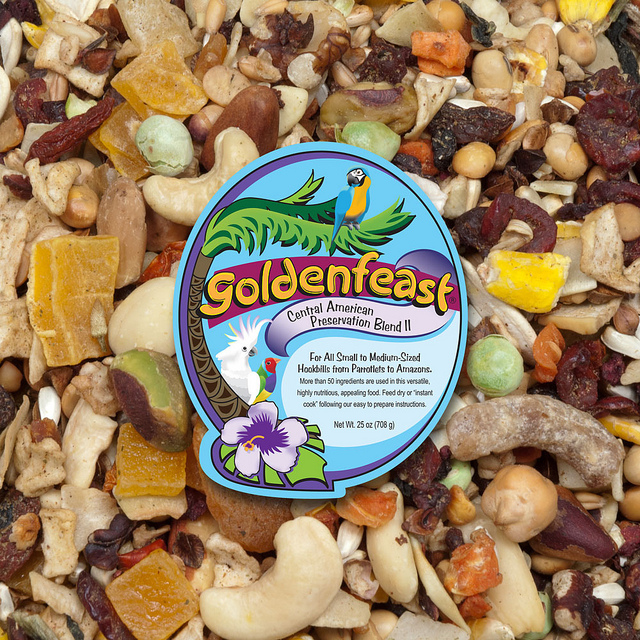 Variety is essential to your avian pet's well being. Formula may also be served cooked. Each package is date coded for guaranteed freshness. 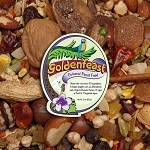 Ingredients: Gourmet roasted and raw Nuts, including roasted Almonds, Cashews, Walnut, Pecans, Filberts and shelled Pistachios, Safflower Seed, Granola made with rolled Oats, whole Wheat, Brown Sugar, Canola Oil, natural Coconut, sweet dairy Whey, Oat Flour, roasted Almonds and Honey. Roasted Corn, Cranberries and Blueberries, Buckwheat, Carrots, hulled Oats, whole Pumpkin Seed, Apples, unsweetened flaked Coconut, cubed Coconut, Mango and Pineapple, roasted Chic Peas, Whole Wheat, Pine Nuts, Pepitas, Whole Star Anise Seed, Apricots, Beets, Dates, shelled Walnuts and Pecans, Cantaloupe Seed, Cherries, freeze dried Cane Molasses, Green Cabbage, Sweet Peppers, Sweet Potatoes, cooked and dehydrated assorted Beans, Sorghum, Chamomile Flowers, Spinach, Wild Flower Seeds, Canary Grass Seed, roasted Soybeans, freeze dried Sweet Corn, freeze dried Sweet Garden Peas, whole Bee Pollen, Natural Fruit Flavors, dried Lactobacillus acidophilus fermentation product, dried Lactobacillus plantarum fermentation product, dried Enterococcus faecium product, and dried Bifidobacterium longum fermentation product. 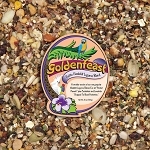 Remove flavor fresh packet from container, add 1 1/2 cups of blend to 3 cups boiling water.